The Chief’s Advisory Committee is made up of local Indigenous and Métis Elders, the Chief of Police as well as numerous SPS officers from different levels of the service. The committee meets four times throughout the year, coinciding with the beginning of every new season, to connect and advise the police service on current issues relating to Indigenous and police relations within the community. The advisory meetings are planned and facilitated by the Indigenous Relations Consultant and the Cultural Resource Unit. They are typically opened with a pipe ceremony followed by a sweat lodge ceremony directed by the Elders. All members of the SPS are welcome to attend. The Committee was established shortly after the creation of the Indigenous Liaison Constable in the early 1990’s. Originally, the Indigenous Liaison Constable would gather members of the SPS, FSIN, STC, and Métis Nation-Saskatchewan to discuss current issues and give recommendations and seek feedback to assist the SPS in working with the Indigenous population in a positive and respectful way. Elders Walter and Maria Linklater were approached by the Indigenous Liaison Constable. They recognized the opportunity and impact that the Committee could make and became some of the first Elders to join. Over the years, many local, reputable Elders and Indigenous community leaders have joined the committee. 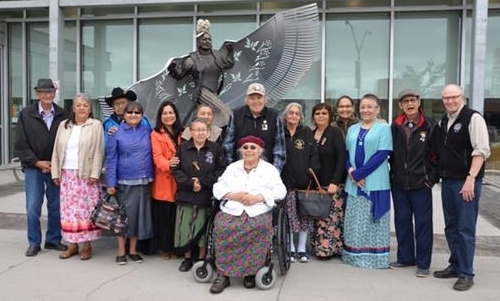 To this day, some original members still attend the meetings and give respected recommendations to the SPS on how to continue the process of connecting and building bridges between Police and Indigenous and Métis communities in and around Saskatoon. 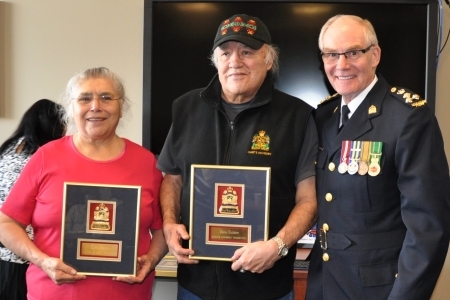 In 2015, the Elders were honoured by Police Chief Clive Weighill with ceremonial badges to signify the important role that the Elders have on advising the Chief on matters relating to the Indigenous community. The connections that have been made, and continue to be forged, have greatly assisted the SPS in working with the Indigenous community through the good and bad times that can transpire in any community.